A new company is on the scene that is catching the attention of thousands and resulting in hundreds of emails asking what we think about them. That company is HydrogenX and we are proud to announce that their unit is our 2019 Top Economy Ionizer! 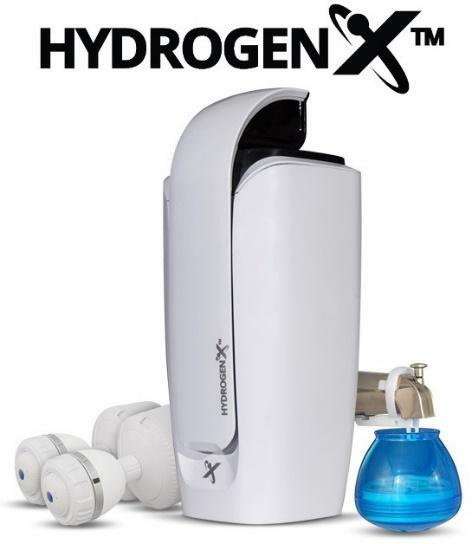 The HydrogenX unit is a compact, modern design that packs a serious punch! When we received it and started testing, we were immediately impressed with its simplicity and results, especially when comparing it to the similar (if not worse) results of much more expensive water ionizers. But what really got us intrigued is the HydrogenX pricing. HydrogenX offers many of the same health benefits as traditional water ionizers, but for less than $500 to get started, which makes us want to get up and dance. What’s really awesome is that they also offer a low monthly subscription plan that includes FREE shipping, FREE maintenance, and what we would consider the best of all, FREE replacement filters FOREVER (2x per year)! This is unprecedented in the water ionizer industry and we can’t see how other companies can follow their path and make the numbers work. HydrogenX also offers some other great health products such as shower and bath filters that can be included in the monthly subscription as well. With the low monthly payment and a 30 Day risk-free trial, we definitely think HydrogenX is worth checking out. We certainly plan on keeping our unit around and are excited to see what HydrogenX will be offering next! The HydrogenX water ionizer membership plan is an amazing concept. Most people that purchase a water ionizer don’t take into account the additional expenses that are required to keep their unit in tip-top shape, and that’s what makes the HydrogenX membership plan so awesome. Furthermore, plates are usually the first thing to go, but this unit uses a more advanced method that appears to be more effective and more natural. We also love the PRICE! At less than $500 to get started, and a low monthly membership plan that covers everything, your water ionizer is fully covered! With HydrogenX plans starting at $24.95 /month, you’re fully covered so long as you are a member. Based on our calculations, this price is much less than what it costs annually to maintain, clean, ship and order filters for traditional water ionizers. Frankly speaking, we expect the pricing to go up in the near future. It seems like HydrogenX is offering such a low price as a promotion to ramp up their subscription list. We did put a call into HydrogenX and they confirmed that anyone that gets in now at their current pricing will NOT be subject to any planned increases. The HydrogenX unit is SUPER simple to install and operate. The unit came with a variety of faucet adapters and was installed in less than 5 minutes. The unit also has a convenient MiniSplay™ Readout display that powers on once water is flowing through the unit and keeps track of filter life and flow rate. The HydrogenX unit does not have any plates, which is standard in non-electric ionizer designs. So, for this category, we take into account the produced pH results as well as negative ORP. The HydrogenX unit had no problems producing over 9.5pH as well as -400 ORP, which is congruent with their website and comparable to electric water ionizers in the industry. HydrogenX has dual filters, which is something you know we love! The filters are .01 micron, which is better than most standard filters and they are very easy to replace. Plus, with the HydrogenX membership model, replacement filters are automatically sent out to you FREE of charge every 6 months. With the hydrogen buzz, we wanted to make sure that this unit was able to create molecular hydrogen. We confirmed that the HydrogenX creates more than enough hydrogen for consumers to reach therapeutic levels throughout the day. Something we’ve never seen before! The HydrogenX price is one of the key variables that earned HydrogenX our 2019 Top Economy Ionizer. With HydrogenX, it’s very cost-effective to get started drinking healthy ionized, alkaline water. Plus, the low monthly membership fee gives you full water ionizer protection, and puts HydrogenX at the top of our low-budget water ionizer list. Calculated annually, this is MUCH more cost-effective than what it costs to maintain, clean and order replacement filters for traditional water ionizers. Our understanding is that so long as you are a member of HydrogenX, your unit is fully covered. Plus, we read that if there is a new unit/model released, you can trade yours in and start a subscription for the newer model. Pretty cool! If you’re in the market for a lower budget water ionizer and really want a steal, then be sure to check out HydrogenX today. Also, if you own a HydrogenX water ionizer already, or looked at their site, please comment below and let us know what you think. For all of the latest and greatest news on water ionizers, don’t miss our Free Water Ionizer Buyer’s Guide. Download it today!